I have been busy rebuilding my DIY CNC machine. It will be all metal when I get done. It will also include a USB interface, likely an Arduino. None of my computers have a parallel port these days. So something has to be done to resolve that issue. 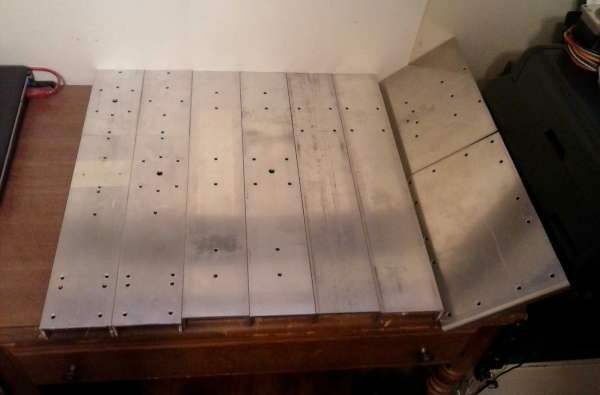 This first picture is the new metal parts all drilled and ready for assembly. Well maybe ready to be filed so they can be assembled….. This entry was posted on Wednesday, August 31st, 2016 at 11:27 pm	and is filed under Arduino, DIY. You can follow any responses to this entry through the RSS 2.0 feed. You can skip to the end and leave a response. Pinging is currently not allowed.